Kelly and I attended our first Cavalia performance in Scottsdale last week–an “equestrian ballet” called Odysseo. Based on some commercials I’ve seen I have referred to it as “It’s Cirque du Soleil, but with horses!” And it is like Cirque du Soleil but with horses. But now that we’ve seen it in person? It was so much more. I felt like a kid at her first Disneyland Electric Light Parade–eyes wide, jaw dropped, clapping, speechless. Who are these people? Who thought of this? How do they DO it? My favorite part was the African dancers. They performed in between the magnificent horse segments, and with the music and their drums and the astounding acrobatics I personally think they stole the show. Getting horses to behave and perform is a big deal, but to continuously back-flip as if springs are on your feet? Some of them literally had springs on their feet. The audience loved it! I’m a believer. I’m not even a “horse person”, but I will see this show every year from now on. I usually take my daughters to the Nutcracker ballet every December, but this event has me thinking about creating a new tradition. We didn’t bring our children with us this time, but there were plenty of families there and plenty of wheelchair accessible seating. I can’t wait for next year, and to watch my children’s faces as they absolutely delight in everything that Cavalia of delivers. It really is a feast for the eyes! I bet could see Odyseeo in particular a dozen times and never be bored. I mostly am annoyed at myself for taking so long to finally attend a performance. If you ever have the opportunity, I encourage you to check it out. The kiddos would enjoy it for sure, but I’m also thinking about making it a date night–maybe consider upgrading your tickets to the hospitality tent. You can’t go wrong. But you CAN bet on finding us here next time. This show is too awesome to ever miss! Last night I was browsing a pregnancy-multiples message board forum and came upon someone who just a day earlier learned that she was pregnant with twins. She was freaking out a little–both because of personal health risk reasons and because well, she has all kinds of babies inside of her. Anybody would freak out with that knowledge. Today marks the 6th anniversary of the absolutely astonishing news that I was carrying twins. My weary reproductive system was already stressed with its own problems–which separately were minor issues but all together compounded the risk to my unborn babies–and was now responsible for nourishing and protecting not one but two babies. My previously well-organized, well-scheduled, laser printer labeled world was turned upside down. Not in a million years did I seriously consider the possibility of carrying twins. I wrote about that a little here and here. This one brought back some fun memories though. In the end I did carry them to 36 weeks–considered full term for twins. And while life sure was disorganized for a while, my Type A personality eventually became an asset instead of a liability. Organizing double the documents, double the doctor’s appointments (and double the co-payments…) and double the immunization records and HELLO COLIC GREAT TO FINALLY MEET YOU were made easier when managed by my high functioning frontal lobe. Also made easier by Argentina and it’s various award winning Malbec, if we’re being honest. To my twins: Happy First Day of Me Knowing You. I hope you enjoyed your accommodations while you were here. Oh, you didn’t? Well, you can blame your brother/sister. Don’t ask me to take sides because I blame you both. I mostly blame the one who kicked me in places that made me feel like she might be birthed out of my bum–I’m sorry, does that bother you, kiddo? Well maybe you should keep your feet to yourself. “Tuck and turn”–it’s not just advice for a golf swing, but also for being birthed. It’s like this book is being written backwards, right? To my waistline: Happy Last Day of Me Knowing You. I hope you enjoyed those size 8’s while they lasted. How about gaucho capri drape-y pants? I hope you liked those. I still have the pants. I miss the waist. ::princess wave:: goodbye, goodbye…. Amid all the blinking lights and batteries… the toys, the books, the clothes… is a package with a personal touch. It’s been a while since I’ve had anything engraved or monogrammed or embroidered. Personalized gifts used to be a favorite of mine. I have fond memories of creating that special, one of a kind, gift. It makes me smile just thinking about it now. I once had a boyfriend who adored his truck. He even named it! Erica was “her” name. I went to great lengths to have a key chain personalized for him. I was at Things Remembered in the mall and I saw this key chain shaped like a steering wheel. Not just any steering wheel… but one much like the custom one on his old truck. I picked up the key chain and had it engraved “Erica”. He was completely blown away by the thoughtfulness of this gift, that I felt like I’d never be able to top it! The girls are starting to go on sleep overs. They’re at that age! I can’t believe it! And when it’s time to pack their stuff… I’m digging through my closet trying to find an appropriate bag. I have tons of them from all of the conferences and trade shows I attend… but I certainly don’t want to send them off with a bag stamped with Eden’s Fantasies or Poise Pads! Haha! I already had been given the opportunity through a PR campaign to make a purchase from Personal Creations and share my experience. I just hadn’t decided what sort of gift I’d be purchasing. I didn’t have any weddings to attend or anniversaries of note upcoming. But browsing through the beautiful and thoughtful gift ideas… I came across embroidered canvas bags. Large canvas bags! With choice of accent colors. And… they were only $19.00 a piece! I was able to get one personalized for both girls AND one for me :) I’ve already been using mine to go to the gym. Their bags are happily wrapped amongst the many packages that I opened this post up with. I can’t wait for them to open them. This gift will be the first item they own that’s truly theirs. With their names embroidered right on them. I am a parent of twins who are in kindergarten. I volunteer in their classrooms with their teachers, aides, and classmates every week. I experienced a visceral reaction to the Newtown, CT grade school shooting. Days later I still can’t wrap my brain around any of it. I don’t bear the burden that any professional educator might, in terms of processing this tragedy, but still I can’t stop imagining and visualizing and I am beside myself. Instead, I shall impart a reminder to you: nothing in this life is certain. Not a thing. Not you waking up tomorrow, not your spouse having a job tomorrow. Not your son being a star on his team tomorrow. Not your daughter being on the honor roll tomorrow. Terrible stuff happens all the time. Accidents happen. Crimes happen. Diagnoses happen. Good things happen, too. Value every single day. A sick day, a healthy day. In a hospital bed, in your kitchen. Do all you can today so that you have no regrets later. Take a moment. Give a moment. Put your damned phone down. You and yours are not immune or insulated from accidents, crime, or loss. And then give as many hugs as your loved ones will allow. 8 year old: Mom, what did night lights look like when you were a little girl? Me: Pretty much just like the ones we have now. 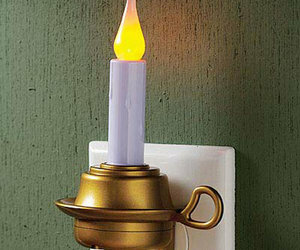 8 year old: But electricity wasn’t invented when you were a kid, did you just plug in candles in the wall? 8 year old: I wonder what kind of night lights Grandma had when she was a little girl, before there was even fire to light a night light candle. ‘Tis the Season! And what better way to celebrate… than to learn about an amazing new way to shop AND have the chance to win a $200 Visa Gift Card!?!? Sweet Relish is a new site with a Pinterest like feel. Shop owners can share their wares and buyers can organize them into curated lists. The best part about Sweet Relish is… not only can you organize the things you want to purchase… you can buy them… right there! This is a brand spankin’ new site… so be patient as they work out some of the kinks… but how fun is it to be one of the first to be using the next big thing! Did I mention you have a shot at winning a $200 Visa gift card? Sweet Relish is basically a tool for organizing discoveries, sharing what you want, and seeing what others like. But unlike Pinterest…. you can actually BUY this stuff. They call call it the “secret sauce” because it’s the missing piece from online shopping. It’s super easy to check off a birthday list, send a list of classroom needs out to parents, or surprise a friend with a gift that she really wants! They’re launching in phases, which means some days they’ll look better than others…. but give them a look. It’s a pretty cool concept! And don’t forget to enter the giveaway for a chance to win a $200 Visa Gift Card! *I was compensated by the PR firm representing Sweet Relish in exchange for sharing information about this giveaway with you.